qualified GATE 2018 they are only eligible to apply for this Assistant Engineer jobs. Final recruitment is based on the Interview and the marks secured in GATE 2018 test. 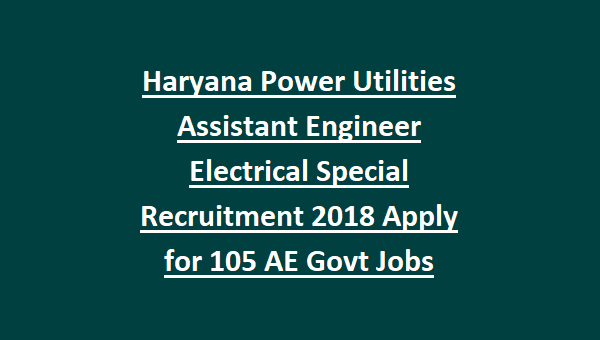 The available posts in this special recruitment of Haryana Power Utilities are Assistant Engineer (Civil/Mechanical/Electrical/IT/Electronics Disciplines) . The candidates who are having the eligibility criteria, they can apply online on or before 01-08-2018 in a prescribed format. 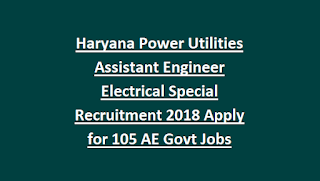 Total available vacancies for this HPU Assistant Engineer Jobs recruitment are 105.
application form through online using www.hpvn.gov.in website. The cutoff date for the purpose HPU Recruitment 2018 qualification / age limit / reservation is 01.08.2018. The candidates who are applying for the posts of Assistant Engineer they must have the necessary qualifications in relevant Engineering discipline from any recognized university. And the candidate must have studied Hindi/Sanskrit as any one of the subject in Matriculation. The candidates must have the 60% of marks and for reserved candidates 55%. Those who are applying for HPU recruitment of Upper divisional clerks they must have qualified BCA from any recognized university with 60% and 55% for reserved candidates or must have qualified MCA form any recognized university. Minimum age limit is 18 years and maximum age limit is 42 years. As per Haryana government age relaxations are applicable. Assistant Engineer pay scale is Rs. 9300-34800 with grade pay of 5400/- as a grade pay. For Female candidates of all categories Rs.125/-. A common written test will be conducted, those who are qualified in written test they are only eligible to attend the interview. Candidates can submit their application form along with GATE Score Card, Community Certificate, Date of Birth Certificate, all educational certificate copies and other relevant documents to the below given address through post only to be reachable on or before 01-08-2018 05:00 PM. Candidates may apply online any one of the HPUs websites - www.uhbvn.com / www.hvpn.gov.in /www.hpgcl.gov.in/www.dhbvn.org.in. Submitted application copy along with necessary documents to be reach to the below given address before the closing date. Please spread this valuable information to your beloved friends through social media. For latest updates of Government Jobs in Haryana Please stay with us.